Make a donation! I create these games for fun, but a little bonus certainly does help with motivation. Recommended donation is $5, but any amount is gratefully appreciated! 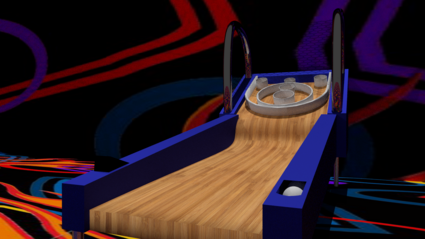 Ramp and Roll is a 3d video game version of Skeeball. Everyone loves SkeeBall! Currently it is for PC/mac only, but before the summer I hope to convert it to Xbox One's Kinect motion control system for 4-player fun in the living room. It is free to download, but please consider a recommended donation of $5, or really any amount. Not only does this help offset some of the costs involved in creating something like this (mostly my time, which is precious! I create everything from the soundtrack to the 3d models myself) but encourages me to keep creating. I have a list of arcade style games like this that I would love to make, and hope to continue working through it. For more details on Ramp & Roll, there is a Facebook page with lots of information, screen shots, and even some video! Please like and share the page to help me spread the word. If you Donate, please include a message if you'd like an email when new versions becomes available.